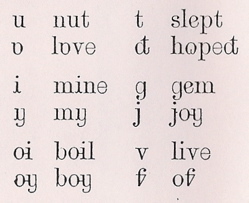 UPP is a self-pronouncing print inspired by Leigh Print, a self-pronouncing print successfully used as an Initial Teaching Alphabet (ITA) in the late 1800's. It was also inspired by a reading of Geraldine Rodgers' History of Beginning Reading. UPP was developed to help remedial reading students improve their reading and spelling abilities while aiding their pronunciation. Another self-pronouncing print was developed by Rev. John C. Zachos and was also used in the late 1800's. Zachos' system was not as well developed as Leigh Print, but he made use of syllables like those used by Webster in his Speller. Some sample documents in UPP are below John 3:16. The key is to the right, below the Leigh Print sample. There is a 4-page version and a one-page version with very small print.